Posted on January 15, 2012	by Linda S.
Now that I have my fabric picked out, the next step for some quilters is to wash the fabric. Usually I don’t do this because I like the sizing that is in the new fabric to hold it a little more firmly than washed fabric. If I am using old fabric or for some reason have to wash my fabric before quilting, I will iron it and use a spray sizing. The next step is to actually make the quilt sandwich. Place one piece of fabric .. right side down… on a flat surface. On top of that, place the batting that has been cut to the size of the top fabric. On top of that, place the top fabric .. right side up. 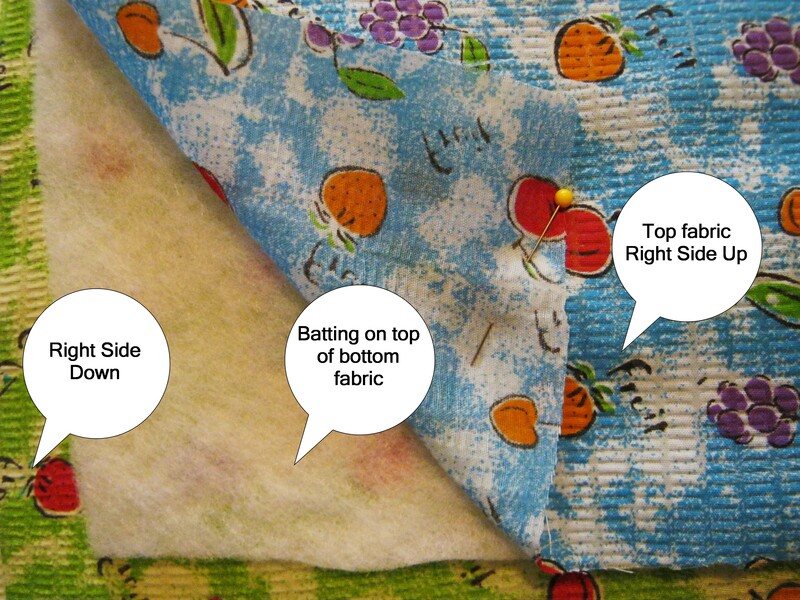 If you will be wrapping the bottom fabric over the edges, make sure you leave approx. 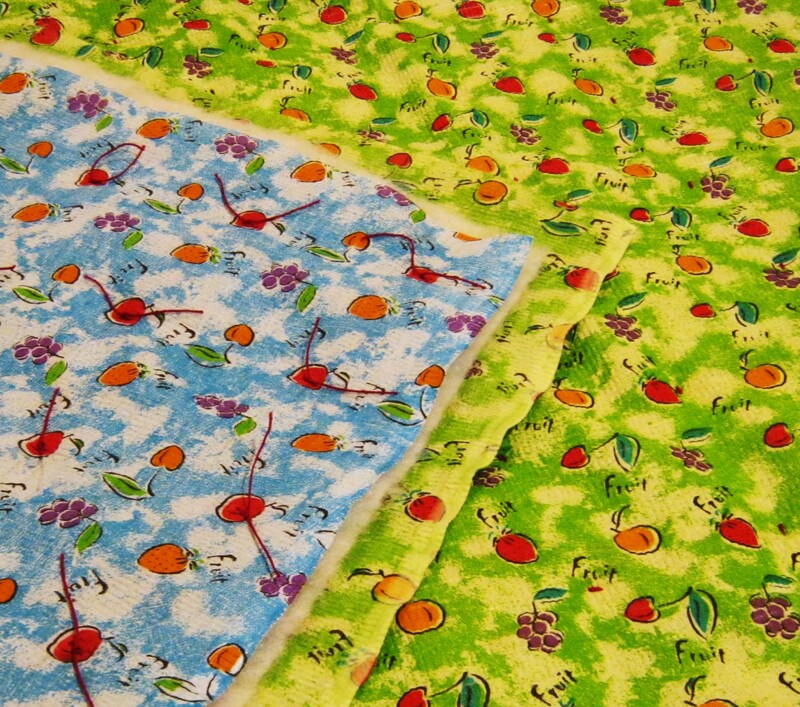 2″ on each side of the bottom fabric for the overlap. Pin evenly over the entire surface of the quilt… making sure that the top and bottom of the quilt are both smooth and even. On a larger quilt, I will baste with a needle and thread and begin in the center of the quilt and baste out toward the corners and center, then around the quilt. This keeps the fabric from shifting as you quilt it whether you use pins or basting. Now is the time for placement in a hoop, if that is what you prefer. 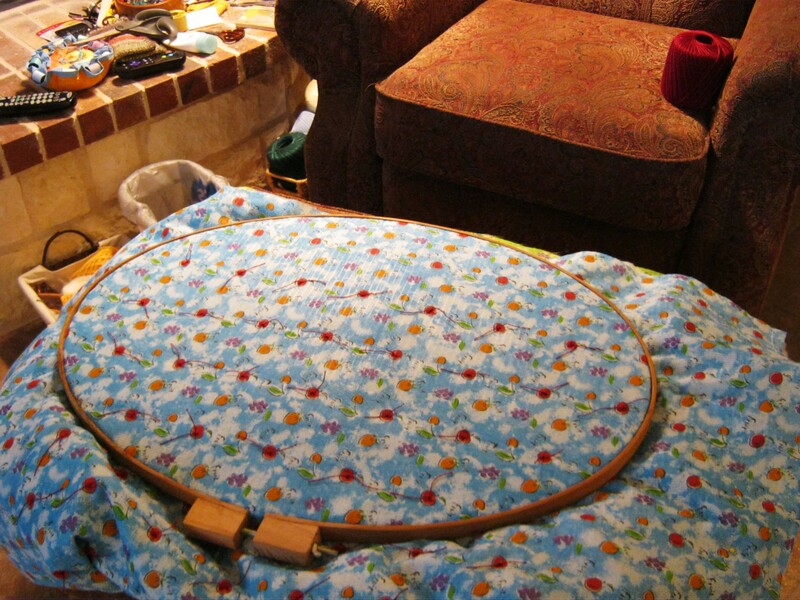 I have a large quilting hoop that I’ve had for years. This is the first quilt that I have been able to use it comfortably! Usually I just baste the quilt very well (or pin very well) and roll the ends under so I start working in the center of the quilt without using any kind of hoop. 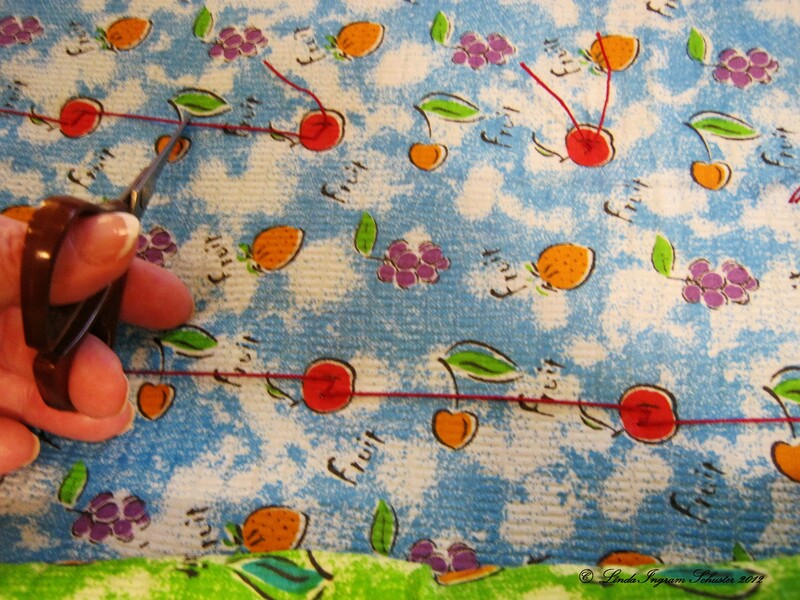 I am using the cherries on this piece of fabric as my measurement, so I begin with a cherry on the right side of the fabric since I am right-handed. I push the needle completely through top, batting and bottom and then come back up just like in the photo, leaving a tail of thread about 1 1/2 inches long. Then I repeat the stitch in the same cherry and without cutting the thread, move over and do the same stitches in the next cherry. 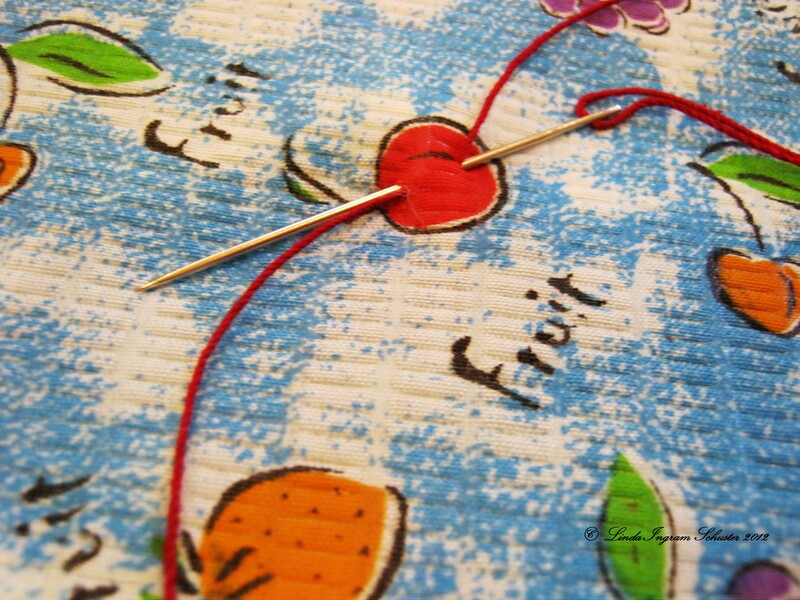 As I go along making my stitches in the centers of the cherries, there is just enough thread when I cut it in the center to leave enough on each side to tie into a tight double knot. Continue this sewing, cutting and tying the knot until the quilting is complete. This entry was posted in Crafts, Free Patterns, Handcraft, Handwork, Historical Textile, Needlework, Quilt, Sewing, Textile Tutorials, Tutorials and tagged craft, crafting, Crafts, create, Free Patterns, handmade, Handwork, quilts, Sewing, tied quilt, tutorial. Bookmark the permalink. Dear Linda, wish you a great year, full of peace, health and inspiration! Love your tutorial!